Without Dr Irwin Jacobs, Sam Walton most probably cannot scale up Wal-Mart with the VSAT technology enabling Captain Sam to solve the inventory management problem that comes from scaling up at the VSAT-network of distribution centers and to video-call his managers to give pep talks for Saturday meetings; and San Diego will not be able to transform from a sleepy West Coast town to a successful innovation hub. That was one of the many insights that the Bamboo Innovator had gotten after hearing the presentation on Driving Growth Through Science and Innovation on 23 January at the Singapore Management University (SMU) by the billionaire inventor-entrepreneur of the CDMA technology that makes over 3 billion cell phones possible. Jacobs, Andrew Viterbi and five others have founded Qualcomm (Nasdaq: QCOM) (to deliver “QUALity COMMunications”), a super-compounder up over 130-fold to a market value of $125 billion or over 40% of the GDP of the country Singapore, and the fact of its scale and continued business model scalability has eluded most in the audience. Not surprisingly, Jacobs was told then that his big idea of CDMA digital wireless technology that creates a unique code for each call and so allows greater sharing of the airwaves simply violated the laws of physics. Thankfully he and his like-minded partners preserved. Qualcomm, through a combination of technological superiority, cunning business acumen to build an innovative business model that collects 3% of the price of virtually every handset sold in the world as royalty, and sheer tenacity, has become the undisputed standard by which telecom companies now measure themselves. Qualcomm’s rise mirrors that of the cell phone: Both are ubiquitous, both continue to evolve rapidly, and both turned the status quo on its head. In a volatile week on contagion fears of an emerging market meltdown and the potential imminent default of a RMB3 billion trust investment product by ICBC (which we highlighted recently in The Chinese Emperor and His Number Two about how the bulk of the debt default risk will come due this April/May, before the news of the ICBC possible default broke out), it is refreshing to hear the story of Qualcomm as a reminder to value investors on the merits of investing in the Irwin Jacobs and Benjamin Franklins rather than indulge in clever tactical investing in the cheap value traps or momentum-driven thematic ideas. 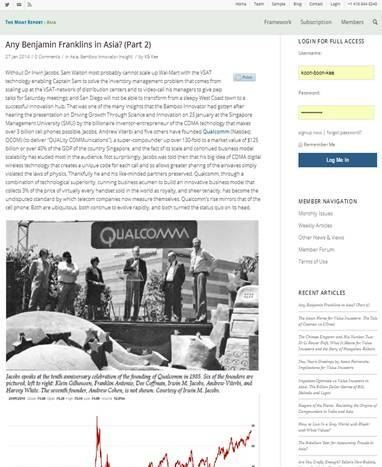 The story of Qualcomm, and its implications for both the growth strategy of Singapore/Asia and for finding resilient compounders in Asia, is an apt follow-up sequel and reflection to our earlier article Any Benjamin Franklins in Asia that was also highlighted by TEDxWallStreet. Growth and entrepreneurship in Asia is not driven by innovation and science given that every creative field — innovation, science, music, movies, books, art — follows a Power Law. They bring into the world richly valued things which did not exist before. Add Singapore’s most valuable firm Singtel (SGX: ST, MV $43.9bn), its most iconic brand Singapore Airlines (SGX: SIA, MV $9bn) and its most resilient value creator, the world’s largest oil-rig designer and builder Keppel Corp (SGX: KEP SP, MV $15.1bn), the largest bank DBS (SGX: DBS, MV $31.9bn) – their combined total of $100 billion is still less than Qualcomm. And these creations take time and effort of a different nature as compared to the asset-based, deal-making trading businesses and positional leadership skill-set for big corporates in Asia. The life of a creative artist and an inventor is a very difficult one as they try to keep alive the flames of the intangible idea that’s larger than their own individual self to provide useful products and services that benefit other. As the great Italian Renaissance artist Michelangelo reflected on the darkest secret of the life of an artist and inventor, “If people knew how hard I had to work to gain my mastery, it would not seem so wonderful at all. If you knew how much work went into it, you would not call it genius.” The Michelangelo, Benjamin Franklin and Irwin Jacobs have no time for Facebook postings or selfies or small talks on themselves or their tangible possessions or what positions other people are having. They care only about the intangible ideas that are larger than themselves and about getting co-creators to compound value together. Now Qualcomm, led successfully by Paul Jacobs, son of founder Irwin Jacobs, is targeting the “Internet of things,” where automobiles, health care devices, and the like are continuously connected, and you can, for instance, remotely control lights or appliances in your home, or medical devices send a signal to your smart watch if your glucose levels rise too high. By 2020, Jacobs says there should be 22 connected devices per U.S. home, up from seven now. More devices means more chips. One of the things that struck the Bamboo Innovator about Paul Jacobs was his comments that ideas come to him in the middle of the night or in the shower or through interactions with other Qualcomm executives. As discussed earlier, true compounders have no time to waste and their brains and time are purposed towards ideas larger than themselves. In our interaction with Asian management over the past decade plus, the Bamboo Innovator like to sense this almost child-like fervour and time spent for ideas, which in the Asian context is deemed immature and foolish since the successful wealthy towkays feel that the mind should be occupied by the loud thought of “can make money or not” or “can be more famous and prominent or not”. That marks the difference between a wealthy local tycoon who creates wealth largely for himself or herself with the usually visible display of lifestyle to portray success and posturing activities to gain fame and social respect as compared to the quiet low-profile inventor-entrepreneurs who lived in the basement constantly thinking and worrying and keeping the ideas burning towards the flames of creation and scaling up. Are there any Asian Benjamin Franklins amongst the 1,000-odd listed companies in Asia ex-Japan with a market value of between $1-$10 billion who can scale 10-100X to $100 billion like a Qualcomm? That is a perennial question that we will be always be thinking about all the time and value-adding to our subscriber community who include professional money managers with over $20 billion in asset under management in equities, successful European-based multi-billion family office, a secretive Singapore-based billionaire who’s a super value investor and savvy private individuals who subscribe to the value investing philosophy. We have been monitoring some of these Benjamin Franklins/Jacobs in Asia over the past decade plus and waiting for that tipping point moment in their business model innovation to feature them in our monthly Moat Report Asia report.